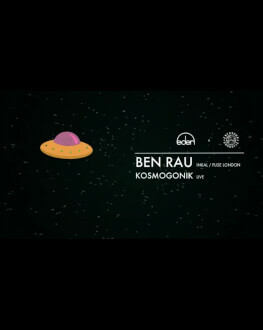 Get ready to bust a move through the solar system with Ben Rau. Engaging his landing gear over Bucharest for the time, the Berlin based dj & producer will welcome you aboard on the 2nd of march. He immersed himself in the highly influential east London party scene, having made the decision to dedicate his life to pursuing a career in music. While Ben was living in the UK, Berlin had become the global epicentre of house and techno and he felt a strong calling to return home. He decided to move back home to build a studio and returned to Berlin with a fresh outlook , a renewed desire to succeed to truly pursue his dreams. Ben continues to garner the attention of tastemakers and clubbers alike onto the Global stage. Kosmogonik is the live act of FILIPP & ardb (Lisière Collectif), two fresh producers from Bucharest that have been not-so-secretly making music for some years now. The project was born spontaneously from FILIPP & ardb’s shared passion for performing their own music live rather than just playing it in their DJ sets. Following on a huge tradition of cosmic inspired music, the duo is constantly trying to find unexplored sonic territories in Bucharest’s underground scene that will make the listener travel in time to the birth of the universe.